Ed Sheeran is an English singer, song writer, record producer and a guitarist as well. He was born as Edward Christopher Sheeran in Halifax, West Yorkshire on 17 February 1991. 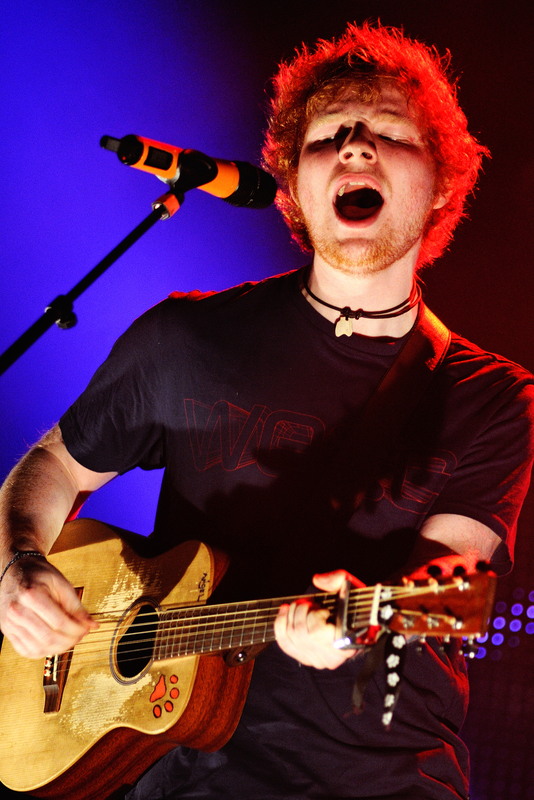 Sheeran started playing guitar at a very young age and he also showed tremendous enthusiasm in writing songs. Sheeran studied at the Guildford Academy of Contemporary Music in Surrey. The creativity of this young man resulted in several Early Plays (EP) and his online performances became a hot topic of discussion among a large number of people. Even without signing with a record label, Sheeran's topped the iTunes charts. His first official EP called The Orange Room was released when he was only 14 and in 2011, he went to London to pursue a career in music. He came up another EP titled You Need Me in 2009 and during the same year, he played more than 300 live shows. In 2011, Sheeran came up with an independent ED titled No.5 Collaborations Project. After entering into an agreement with Asylum Records, he released his debut album called + (Plus) in 2011 itself. One of the singles called The A Team available in this album won him the Ivor Novello Award and he also won the Brit Awards for the best British solo artist in 2012. Sheeran released two albums in 2016 and 2017. When Ed Sheeran was in US, the famous Jamie Foxx invited the young man to appear on his radio show. He also made a guest appearance in Red, an album created by Taylor Swift. At the 2013 Grammy Awards, 'The A Team' was nominated for the Song of the Year and during the award function, he go the opportunity to perform with Elton John. Sheeran came up with the second album called in X (Multiply) in 2014 and it peaked at number one in many UK and US song charts. One of the songs from this album titled Thinking Out Loud won him two Grammy Awards in 2016. ED Sheeran's third album ÷ (divide) reached the number one spot in US, UK and many other international markets. The amazing popularity of Edward Christopher Sheeran also helped him find a place in Debrett's list of the most influential people in UK. Find out Ed Sheeran lyrics you love and enjoy! Ed Sheeran Performs 'Shape of You'! ● victoria orenze we have come..
● babe uwi kana kejs loraine m..
● bakit mo ako iniwan kejs lor..
● oh jesus came down and lifte..
● african medley lyris song la..
● sia ft sean paul cheap thri..
● ex battalion a z bootyful ly..
● tu hi meri dunya hai downlo..
● hey now hey (the other side ..
● english songs 2 4 time signa..
● nothing but skin between us ..
● tagalog songs 2 4 time signa..
● your love dey sweet for body..
● blow haha blow with a lot of..
● sal houdini i just feat ri..
● rhythm city song all of my l..
● nick helm love ya tonight! ● things are getting better go..
● martin hall feat anders pett..
● vybz kartel cake soap mp3 do..
● david g songs (my trust is o..
● ebony turn on the light l..
● hlengiwe mhlaba song he lift..
● justin bieber ft n selena g..
● justin bieber ft nselena go..
● tanya goodman sykes he speak..
● my jesus i love lyric by pau..
● i belieave rap by communion ..
● lyrics: he lifted me utp hle..
● mujhe lauta de wo mera pyar ..
● not afraid of the dark from ..
● been around this party been ..
● let me see your power and gl..
● i jus wanna be blessed with ..
● despecito justin beber in en..
● beautiful eyes hide beautifu..
● turn me around by samsong @ ..